The Quantum Encryption and Science Satellite (QEYSSat) mission will demonstrate quantum key distribution (QKD) in space. 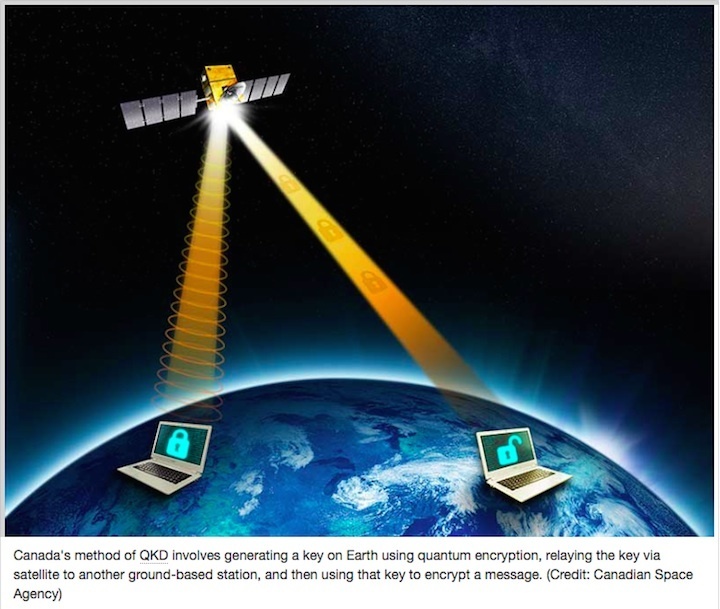 QKD is a technology that creates virtually unbreakable encryption codes and will provide Canada with secure communications in the age of quantum computing. The Canadian Space Agency will fund a technology demonstration mission. The supporting science will be developed by the Institute for Quantum Computing, a research institution of the University of Waterloo. What will QEYSSat be used for? In the era of online banking, smart phones, and cloud networks that store vast arrays of personal information, reliable data encryption is essential. But the technology used to protect our information today will soon become inadequate with the emergence of powerful, high-speed quantum computers. The exceptional processing power of these next-generation computers will easily break current encryption codes which protect our passwords and personal identification numbers. It is estimated that this technology will become widely available within the next 10 to 20 years. So, how can we safeguard our privacy and continue to exchange sensitive information in the future? Quantum key distribution (QKD) technology was created to respond to the threat associated with emerging quantum technologies. This new technique will ensure the confidentiality of information exchanged between two parties – it uses photons (individual particles of light) and the laws of physics to generate private encryption keys between two users. QKD enables two parties to produce a shared random secret key known only to them, which can then be used to encrypt and decrypt messages. An important and unique property of QKD is its capacity to detect the presence of any third party trying to intercept the key. QKD is only used to produce and distribute a key, not to transmit a message. Although ground-based QKD devices are commercially available today, their capacity is very limited. Existing systems rely on fibre optic cables to transmit quantum particles on land, but the signal becomes unreliable at a distance of over 200 kilometres. In order to integrate QKD with all forms of communication technology across the world, the network must be able to use satellites instead of cables. The QEYSSat mission will perform a demonstration of QKD from space. Individual photons will be sent through a laser link from a ground station to a microsatellite, which will use the QKD protocol to establish a key that will be retransmitted to a second ground station. This trial will allow Canadian scientists to study how QKD behaves in space, and lay the groundwork for a global network supporting the exchange of quantum keys over long distances. QEYSSat will bring Canada a step closer to the realization of a truly secure communication infrastructure that will enable national and even global interconnection. Since the encryption key cannot be compromised, it is virtually impossible to crack, regardless of any current or future technology. Integrating this technology into our communication networks would guarantee the privacy of Canadians' public, private, and commercial data. to lead the science of the QEYSSat mission on behalf of the Canadian Government. Recognized internationally as a centre of excellence in quantum computing, IQC will work to advance the development of QKD to provide Canadians with security, safety, reliable government services and protection of their privacy.